Program starts at 03:45 Show welcome! 05:00 Local, provincial and international news including social technology community wants justice with shared economy publishing open letter and Demolishment of beautiful home at 6088 Adera Street, Vancouver brings people out for a protest rally tomorrow, Saturday 2pm. 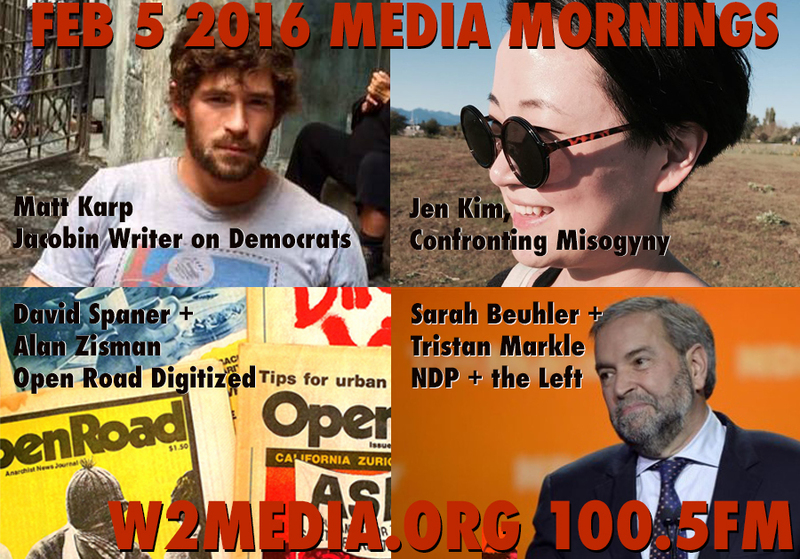 17:00 Jennifer Kim, Guerrilla Feminist Collective on anti-misogny organizing in response to the V Roosh website. Men had been encouraged to meet Saturday night in Vancouver at the VPL south side, but since Wednesday reinvented themselves as victims of feminists and said they were going underground. The Guerrilla Feminist Collective planned a meetup in response to the call for 7:45pm Saturday. 25:00 Matthew Karp, Writer with Jacobin and Professor of History at Princeton University. The War on Bernie Sanders—How the Democratic Party elite has launched a virtually unprecedented attack against Bernie Sanders.